In a hypothetical calculation, a pair of flies -- where a fly would take up 1/8 cubic inch (2.05 cc) -- that began to breed in April, if all were to live, would produce 191 quintillion 10 quadrillion (191, 010, 000, 000, 000, 000, 000) flies by August, which would cover a sphere the size of our planet earth 47 feet deep (14.3 m)! Thankfully, this will never happen, because predators, parasites, and other factors prevent this from occurring! Flies are an essential part of our ecosystem. 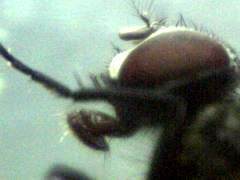 The magnified (60x) wing of a housefly, Musca domestica. (60x magnification.) The hairy pads on each of the houseflies six legs allow it to cling or run upside down. (60x) The head and mouthparts of a domestic housefly. Fly clipart image at top of page courtesy of Agricultural Communications / Texas Cooperative Extension.